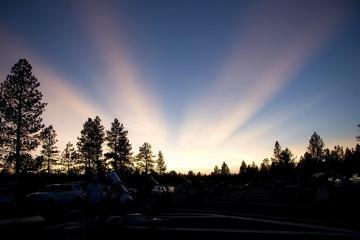 Crepuscular rays above 45 telescopes at the Bryce Canyon NP Astronomy Festival. They don't show up in the thumbnail, but click the photo for a larger version. 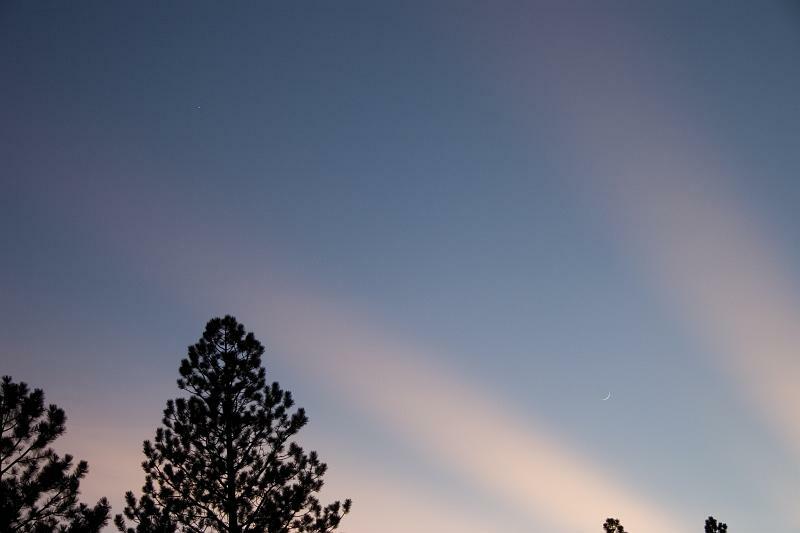 The two-day moon is in the lower right, and Venus is in the upper right, with the crepuscular rays in the foreground. A few weeks ago Mojo and I toured some of our great Western National Parks and Forests and participated in their public star parties. 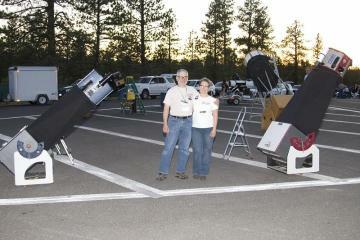 To us, there is nothing better than when sidewalk astronomy collides with National Park dark skies. Here is a view we saw as we were setting up our telescopes on the last night of the Bryce Canyon National Park Astronomy Festival. Crepuscular Rays! A 2-day old moon, and Venus are also visible in the image if you look carefully. Crepuscular rays are rays of sunlight that appear to radiate from a single point in the sky. These rays, which stream through gaps in clouds, are diverging columns of sunlit air separated by darker cloud-shadowed regions. Dust, small aerosols and moisture droplets scatter light to make the sun's rays visible and cloud and mountain shadowed air dark by comparison. Various airborne compounds like smoke particles scatter the sunlight and make these rays visible. The reason we see the light so defined is because of diffraction, reflection and scattering. Crepuscular rays are near-parallel, but appear to diverge because of linear perspective. They often occur when objects such as mountain peaks or clouds partially shadow the sun's rays like a cloud cover. Although the Sun's rays strike the Earth almost parallel to one another, we see them appear to come from a point because of perspective - at a distance, parallel lines seem to converge, like railway lines disappearing over the horizon. We also saw the anticrepuscular beams in the East. These rays appear to converge towards the antisolar point - the point in the sky directly opposite the sun. But I was so taken with the view of the moon and Venus in the crepuscular rays that I forgot to take that other picture!